As soon as we allow discontentment into our thought life, we are on the path to nowhere good. “He is not as romantic as he should be.” “He doesn’t treat me kindly all the time.” “I am not happy.” “He ignores me too much.” “He watches too much TV.” “He doesn’t help me with housework and the children enough.” “I am bored at home.” “I could accomplish so much more than simply raising these children.” “There’s got to be more to life than housework.” And on and on the list of discontentment goes. Discontentment is self-pity and as Oswald Chambers wrote, “Self-pity is satanic.” Feminism hasn’t made women happier and more content. No, it’s made them more unhappy, discontent, and full of self-pity. Life and our circumstances aren’t about making us happy. They are about making us more like Christ. Eve stopped being thankful for the position that God put her into in the garden and seeds of discontentment were placed in her mind that reaped tragic consequences. Satan beguiled her with the question: “Hath God said…. ?” His desire is to kill, steal, and destroy. He wants women asking, “Hath God really said that young women are to marry, bear children, and guide the home? Hath God said that women should be keepers at home and silent in the churches? Hath God said that wives are to be submissive to their husbands in everything?” Feminism is simply acting as Satan’s agent of destruction. If a woman believes she is “dying inside” and blames it on her husband, she has made her husband an idol instead of finding her satisfaction and fulfillment in Christ. Women naturally rebel against their husbands (Genesis 3:16) and try to find fault with them so we must always be on guard against doing this. God wouldn’t have had to tell us so many times in His Word for us to submit to our husbands if it came naturally and easy for us. Discontentment among women in marriage is a common malady today since 70 – 80% of divorces are initiated by women. We must constantly be aware of this in us, women. We must do everything we can to fight against Satan’s questions and doubts he tries to plant in our minds and put on the full armor of God every day. Remember to be continually renewing your minds with the truth of God’s Word and taking every thought captive to the obedience of Christ. Let the Word of God dwell in you richly, meaning frequently meditating, reading, and studying the Bible. Learning contentment is a deliberate choice, as believers in Jesus Christ, to be joyful and content and to love our husbands as stated in 1 Corinthians 13:4-8, even if we aren’t feeling loved by or love for them. It’s learning to say, “The JOY of the LORD is our strength” and believing it. It’s learning to live for the Lord and His glory, not our own. Be thankful. Dwell on the good and the lovely. Live a life of service to others. Rejoice. Count your blessings. Learn contentment in God’s good, and acceptable, and perfect will for you! 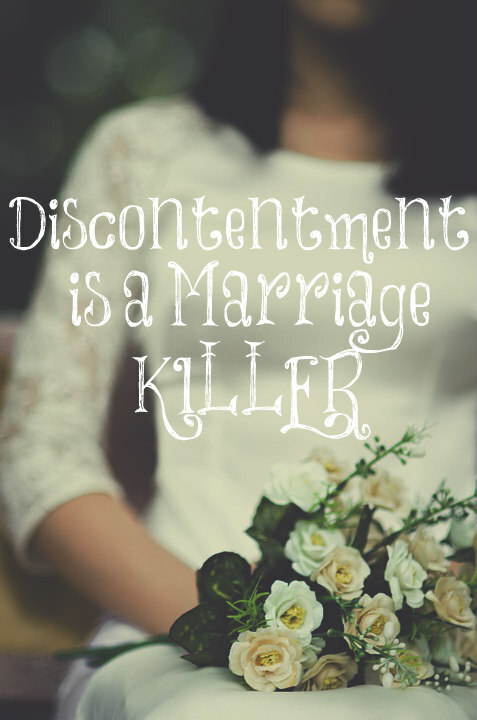 Never allow discontentment to kill your marriage. A lot of couples only think of “me, me, me…” but never think to serve the other! Women have been told through radical feminism the man must serve and treat her like a queen, but she can treat him like a peasant in return and society accepts it! It’s all about what she wants, if the husband wants to move, do something else, or any decision that will affect the both of them, more often than not, he will be branded sexist and domineering if he insists doing it his way this time around! Conversely, if a woman wants to do something but he objects, he must unquestioningly follow her or else the same outcome! If he wants children but the wife doesn’t anymore, -sexist!, if he likes that dress over this one, -sexist! It’s socially acceptable to joke about deriding your husband and all his negative qualities, whereas if he dared speak of his wife the same way, it’s decried! In such an atmosphere of double standards, and “all about her” attitude, no wonder there aren’t more divorces! The traditional devotion and love and sacrifice of a wife is no longer socially sanctioned, and in this society of instant gratification, any imperfections in one’s partner means throw them away for the new one, not repair them and honor one’s marriage vows! Abuse is about the only circumstance I would ever encourage divorce! In that case, perhaps he should leave his domineering ungrateful wife! Well said Lori. I was telling a friend today that I’m learning to be content with what I have. I love my husband and my daughters and I wouldn’t trade this life for anything. Amen! Thanks for the continual encouragement!! Well said, Lori. Lately when I have caught myself being discontent or bitter at something/someone, I have been reminding myself to do it “heartily as unto the Lord, and not unto men” – for I know I don’t deserve anything less than eternal damnation! When I focus on this, the Lord in His graciousness and mercy frequently dissipates the discontentment and bitterness, and replaces it with peace so I can serve Him with the honor He deserves. Thank you as always for your encouraging posts filled with truth, and God bless you for your faithfulness! You’re so right! We deserve NOTHING! Expectations and discontentment clearly shows a sense of entitlement and that we “deserve” something we are not getting. This attitude destroys marriages and nations as we are seeing in our own nation. Thank you Lori! Such a good reminder! Thank you for always encouraging my heart & walk! Thanks. I hope this post gets lots of exposure. All of us are prone to discontentment, but we don’t like to admit that an attitude change is possible or even desirable. The women hearing the apostles’ teaching probably had to put up with quite a bit more than we comfortable 21st-century women. You’re right about that, Heidi. The battle truly is in the mind. Who are we going to listen to: the lies from the enemy and our culture tells us or the truths and promises that are in God’s Word? Wow, Thank you for writing this – it needed to be said, and I would only be persecuted for doing so. Awesome article. You are really at the root of it. … even if we aren’t feeling loved by or love for them. Part of the problem is that the Bible commands love, but people confuse that with some sort of feeling. A man is to love his wife like how he cares about himself. That is not romantic, but it should be received with gratitude. 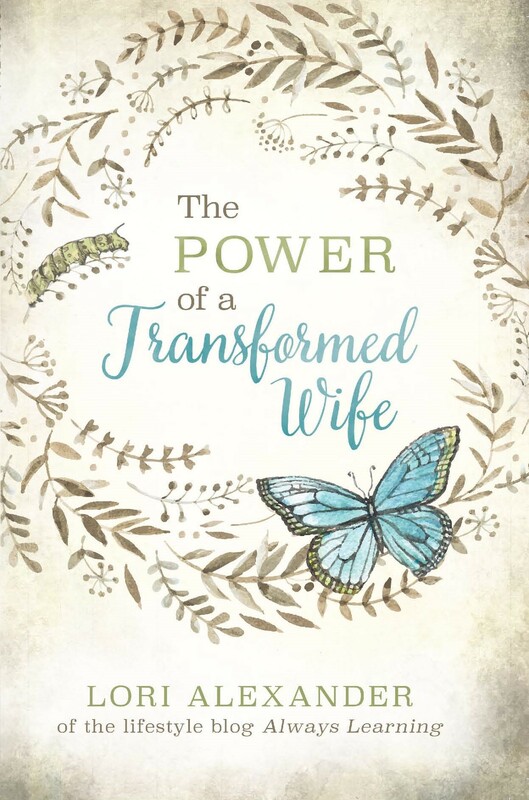 If wives want more than that, they should try treating their husbands reverently, “as unto the Lord“, and they will then likely remain the utmost object of his affection and desire. How do I get my wife to read this? Those descriptions only begin to scratch the surface of accuracy in her character. How do you call to life that which does not exist? Its not like we can command dry bones to come to life….there aren’t even any bones to talk to. I have been struggling with for some time now. My husband retired 2 years ago and has done nothing but drink beer and play on the computer since I’ve tried talking to him about it but he says he’s happy just the way it is. I can hear people telling me to volunteer but I am physically disabled and can only leave the house if he takes me out. I have no one or nowhere to turn so if you could give me ideas to be more content I will continue to try. But also when is it enough. Thank you, great reminder. Those words were in our wedding vows. If that’s not a sign don’t know what would be.